The highest-ranked Corsair Captain under Dalamyr’s command, Delgamar has been granted the station of Gatemaster of Umbar. Though this requires him to spend the majority of his time guarding the ports and gateways into the shadowed city, Delgamar still captains his ship on raids up and down the southern coastlines of Gondor. 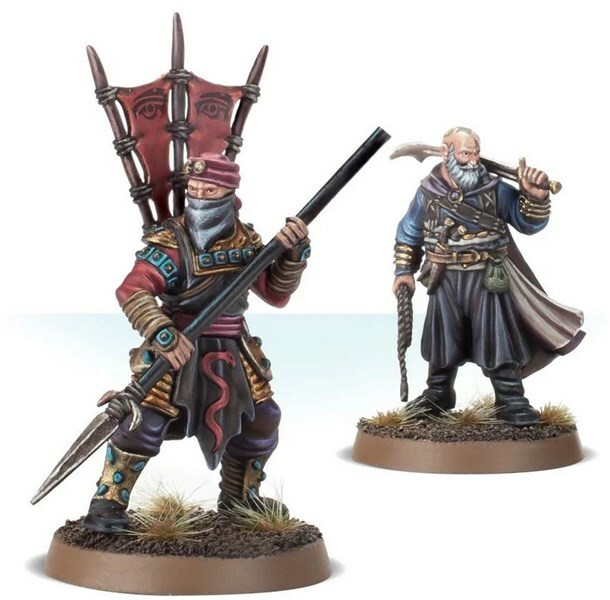 Those under Delgamar’s command will follow his every order, for those who disobey the Gatemaster of Umbar will feel the searing pain of the lash of the captain’s whip. When Suladân’s rise to power began, other ambitious chieftains often sought to dethrone the future Serpent Lord. Whenever such conflict arose, Suladân would call on Râza, his own personal bodyguard. Unshakably loyal, Râza would be commanded to seek out the enemies of his master and dispatch them in such a way as to make an example of them for their treachery. With Râza under his command, it wasn't long before Suladân’s rule was cemented, and Râza would earn the moniker of the Fang of the Serpent. This set contains not one, but two Heroes for your Evil army in the Middle-earth Strategy Battle Game! Used together in the same army make a cracking team – the former leading fellow Corsair Warriors in battle, the latter being a supreme hunter of other Heroes. Râza is a Hero of Fortitude for the Haradrim, while Delgamar is a Hero of Valour for the Corsairs of Umbar. Rules for both miniatures can be found in the Gondor at War supplement book. This kit is supplied in 10 resin components, with 2x 25mm plastic bases. Râza is armed with a spear, and has a choice of two heads – one with scarf over his face, the other with face showing. Delgamar is armed with a sword, whip and throwing daggers.